Today I’m looking at two different types of procedures, Recursive and Iterative. Many problems can be implemented using both techniques which have both benefits and drawbacks. For those not acquainted with the terminology an iterative procedure accomplishes computation with a block of code that repeats many times until a terminating condition is met. The repeating block of code is commonly called a loop and can take many different forms. One of the main drawbacks of an iterative design is that it can become quite complicated making it harder to understand its function. However this is a trade-off to get higher performance and to keep the size of the program stack small. Recursive procedures however are quite different as they infrequently make use of loops. Instead they achieve repetition by invoking itself. The Fibonacci function is a classic case. Fib(x) = Fib(x-1) + Fib(x-2) where the first two entries are hard coded to 1. It’s important that recursive functions have a basis case or a maximum depth to the number of calls otherwise an error called a stack overflow can occur. Basically a stack overflow is simply when the program stack literally overflows with too much data. The program stack has to store the local variables and return addresses for completed functions, recursive functions typically use up a lot of stack space. Another disadvantage is that function calls in many modern OO langauges are relatively expensive in terms of time required, as some languages require a pointer or two be dereferenced to access the function. return series[z-1]; // end of the array contains the result. Normally I’d say Iterative functions are usually faster, and in the case of the Fibonacci function that can be demonstrated, but with more complicated problems and algorithms it is much harder to prove. It’s simpler to construct the code and measure the performance! So to get an idea of the impact of function call overhead I decided to implement a problem in Java using a recursive and iterative algorithm. The problem I have chosen is finding a path within a maze. I chose it because I already had some maze generation code and the depth first search algorithm should have similar performance when implemented both ways. The maze generated is supposed to have loops in it (ie it is not perfect) so I had to code the two procedures carefully to ensure they would pick the same path. I included a breadth first search algorithm (implemented iteratively) as well for comparison, it is guaranteed to find the shortest path where as both the depth first search implementations are not. The testing procedure involved generating a maze and determining the rate at which each algorithm could compute paths in the maze. The start and end points were set randomly but the random number generator seed was reset to be the same at the start of each algorithms run. This means that they should have to compute the same paths. I set the program to repeat this process 10 times to get some results for today, but I have a more powerful machine repeating the process 1000 times, just I have to wait several more days for the results. In implementing depth first search in both techniques there was a minor difference in the algorithm that I couldn’t avoid at the time. The recursive algorithm is smarter than the iterative one in a subtle way. When moving back up the tree after hitting a dead end the recursive algorithm intrinsically remembers which directions it has tried at nodes it returns to. The iterative algorithm isn’t as clever, it checks all the directions again (in the same order). This should make the iterative algorithm slower as it does more processing when moving back up the maze after hitting a dead end. How much slower? I don’t know, but hopefully not much. The results are interesting but unfortunately not definitive. 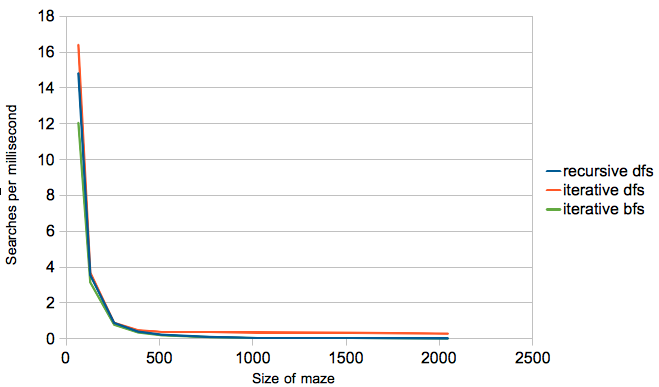 You can see that the two depth first search algorithms are fairly close in terms of rates, although the recursive algorithm tends to be faster until the maze size gets larger. I have tried it a number of times to see how consistent the results are. I found that the breadth first search generally gives fairly consistent results, but the two depth first search algorithms can vary depending on the mazes generated. More often the recursive algorithm is faster but in some data sets the iterative one is faster. I did some other small scale tests and it seems the processor has an effect on the results. I’m guessing the JIT compiler has different optimisations for different processors which is changing the results. It is entirely possible that the JIT is optimising out the expense in using recursive calls although I think this unlikely. This leads me to believe I need more data, so I’ll wait until I get results from the machine testing 1000 different mazes. I did these smaller tests on my Macbook and was unable to test with mazes larger than 512×512 because of a stack overflow. The machine I’m doing the larger tests on is managing to run at a maze size of 1024×1024 because it has a different java run-time. (running under Linux) I might have a go at making the Iterative depth first search function more like the recursive function in terms of smarts but we’ll see if the larger tests reveal anything more.